Orders for stock items received by 1pm (Mon – Fri, excluding bank holidays and holiday shutdowns) will be dispatched the same day by Royal Mail or Carrier. We also do our best to despatch any orders received after 1pm on the same day also, we just can’t guarantee orders received after this time will be dispatched the same day. Orders received on a Friday may be delayed by the weekend for delivery. Esentially we are happy to deliver anywhere in the world. We're based in the UK and are located in a town called Huddersfield, which is in West Yorkshire. All orders made through our website will be despatched from here. We have set our site up to accommodate all UK and international destinations around the world, essentially if we can get a carrier from the UK to your country, we’re happy to deliver! We accept payment in British Pounds, Euros and US Dollars either by Credit / Debit card or through Paypal. Please see our world reach map for a list of all the international destinations we have shipped to so far. If you have any questions or concerns about orders, please contact us. We are more than happy to accommodate international customers. Polite notice: we do not offer a collect from store service, however if you are local to our area you are welcome to visit our trade counter and purchase in person. Free Delivery – This is offered as standard on all items, we estimate 3-5 working days for delivery. Many of our customers generally receive their order in 2-3 working days, this is not guaranteed however. Smaller items will be dispatched via Royal Mail, larger items will be despatched via one of our carrier partners. Standard – This is a first class service offered on all items, we estimate your order will be delivered in 1-2 working days. Please note that first class does not guarantee a next day service, however we generally find our customers do get their order next day. Express – Order before 1pm and we will send your order out via an express, signed for courier. This is guaranteed to be delivered next working day. We also do our best to despatch express orders placed after 1pm out the same day also, however orders placed after the cut of time cannot be guaranteed for next day delivery. Free Delivery - Free delivery is offered on all items we sell which can be sent by Royal Mail. Please be aware that certain items in our extensive product catalogue are either too large or too heavy to be sent with Royal Mail, for these items we have no choice but to send them via a carrier, which is a chargeable delivery service. Royal Mail offer a flat delivery charge across the UK, unfortunately carriers do not. For the size / weight of some of the items we stock carriers charge significant surcharges to Scottish Highland destinations. This unfortunately means we are unable to offer a free delivery option for items that are too large to go via Royal Mail. With our free delivery option we estimate you will receive your order in 3-5 working days via Royal Mail. Standard – Your order will be sent first class Royal Mail or with one of our courier partners, depending on the size / weight of the items you have ordered. Please note that first class does not guarantee a next day delivery. We estimate your order will be delivered in 2-3 working days to the Scottish Highlands based on experiences our regular customers have with us. Royal Mail offer a flat delivery charge across the UK, unfortunately carriers do not. For the size / weight of some of the items we stock carriers charge significant surcharges to offshore destinations. This unfortunately means we are unable to offer a free delivery option for items that are too large to go via Royal Mail. Standard – Your order will be sent first class Royal Mail or with one of our courier partners depending on the size / weight of the items you have ordered. Please note that first class does not guarantee a next day delivery. We estimate your order will be delivered in 2-3 working days to offshore destinations based on experiences our regular customers have with us. Standard – Your order will either be sent by signed air mail, or by a signed for service using one of our courier partners depending on the size / weight of the items you have ordered. Please note that we will only send orders signed for to Southern Ireland, irrespective of the size or quantity ordered. This is to ensure all our customers receive a secure, reliable service from us. 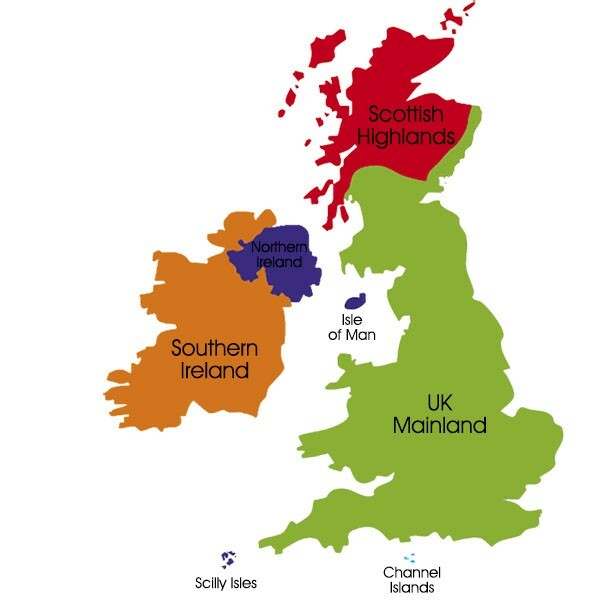 Royal Mail offer a flat delivery charge across the UK, which includes the Channel Islands, unfortunately carriers do not and class the Channel Islands as an international European destination. Due to carriers classing the Channel Islands as an international European destination we are unable to offer a free delivery option for items that are too large to go via Royal Mail. With our free delivery option we estimate you will receive your order in 3-5 working days. Standard – Your order will be sent first class Royal Mail or with one of our courier partners depending on the size / weight of the items you have ordered. Please note that first class does not guarantee a next day delivery. We estimate your order will be delivered in 2-3 working days based on experiences our regular customers have with us. Your order will either be sent by signed air mail, or by a signed for service using one of our courier partners, depending on the size / weight of the items you have ordered. All other European destinations: 2-3 weeks. This includes North America, South America, Canada, Australia, New Zeeland, South Africa, Russia and any other country not listed above. Generally we estimate up to 3 weeks for delivery depending on where you are in the world. Usually this will be much faster, we simply have no way to guarantee that. We are more than happy to ship worldwide, please see our world delivery map for a list of all the international destinations we have shipped to so far. If you have any questions or concerns about orders to your country please contact us. We are more than happy to accommodate international customers.